The camera I've got right now is pretty pathetic. Some digital point-and-shoot nonsense that always produces pixelated images and doesn't capture anything unless it's bathed in direct sunlight. What I really want to do with a camera is take pictures of trees and such (from a fair distance), maybe close-ups of leaves or wildlife occasionally, and basically just all-around nature photography. I'd like to be able to use it on days that are cloudy, or in evenings where the sun is waning as well. I don't really want to spend more than $500 (CAD), so I'm wondering if I can get a very nice camera for that amount, or if I should just hold off for awhile. I want something that I will be using for years, not an 'entry level' camera or whatever. I tend to be pretty sparing with my possessions, so when I want something, I want something that isn't just a toy. Obviously I'm gunning for something digital, good resolution, and sharp images. I realise the last need will come from a good and still photographer, but the camera I've got right now isn't even capable of taking a good picture on a tripod while timed. Any photography technique resources you can point me to on the net would be much appreciated too. PS: Although I say nature photography, and vast landscapes do interest me, priority is a medium distance (couple hundred metres?) type of shot. If there is stuff that can do both, that'd be amazing, but I don't live near mountains so it's not that important. I think a good base camera is a Nikon D40, spend the rest on whatever lenses youd like. For super close ups get a macro lens. Do you want a point and shoot or a bigger camera like a DSLR? The DSLR will obviously have better image quality (don't get fooled by megapixel counts) and will do a much better job taking low light photography. That is a good price for a very good entry level camera. Other options would be a Rebel XT, XTi or XSI for a bit more (probably used to be at your price range), Sony A300 (I've read the newer models 330/380 aren't as good) or Nikon D60 (or D40 for a bit more), but honestly, I'd get that XS. Other things you'll probably want to buy are a new memory card and a UV filter. I don't need anything super compact. Is DSLR superior in every way except weight and size? and money. lens can be frustrating for a newbie and will definitely cost you a lot of money. the canon s90 and g11 are around your budget and are very good cameras. don't get a DSLR until you tried it first. ask a friend if you can borrow his DSLR for a day and see if you like it. Premium point-and-shoots nowadays have pretty good manual control combined with ease of use. i started with a 400D moved up to a 40D and now have the 7D. The best ive used by far is the Panasonic LX-3 and G11. The LX3 has a great lens with an aperture of F2 to F2.8, (its wide, and pretty bad for portraits) Ergonomically the G11 is King of point n shoots, love the dials and i can use my 580EX II and pocket wizards huge plus!!! Now, What would i get in your postion? 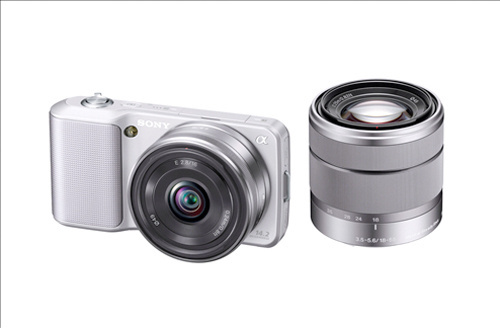 I would take a good look and the Sony Nex-3 and Nex-5, it is small and has a aps-c sized sensor. Excellent low light capability, EXTREMELY easy to use(operates likes a point and shoot) But still has all the manual controls, for you to grow into albeit buried in menus. Shoots pretty exceptional HD video. Im going to add this to my arsenal. 100 bucks over your budget, but interchangeable lenses+lens converters, low light quality,plus actual control over your camera = totally worth it!!! raw is like a digital negative, it is all the information that the sensor takes in, giving you sharper, less noisy/grainy pictures, and you can fetch a higher dynamic range. It's not just manual control or image stabilization. I have a Canon A720 point and shoot which is still a really good point and shoot, but the images just don't compare to my DSLR. I guess what I'd say to you, Chef, is that it's kind of like audio equipment. If you stay with a really good point and shoot, you probably won't notice the difference in pixel density and image sensor quality. But once you use a DSLR or even a good film camera, it'll probably bug you. Wow, that Nex-3 looks really nice. But 700 dollars CAD (what I found it for on sony.ca) is really a little too much.. Maybe I will just wait awhile for it, I'm not in any super hurry (I always research a long time before I make a purchase anyway). Do you think those photos were taken with just the camera and the lens it came with, or was it another super expensive lens on top of it? DSLR definitely sounds attractive, Jibba... As I said in my OP, I'm not just looking for a toy, so I have the patience and time to learn how to use a camera. I just don't want to see myself in 3 years thinking 'this is really unsatisfying, I need a much better camera.' I want my photos to be limited by my ability, not by the camera. If everything looks the same no matter what I do, it will be a very unfulfilling experience. I appreciate the starting points here Will keep checking this thread as long as people have advice. Photo.net/learn is a pretty amazing resource. It's advice seems to be quite solid. I think I'm going to wait a little while until I can afford an DSLR and a decent lens to go with it (they seem to advise getting a lens with zoom similar to the the human eye). It seems like that will cost like 800 bucks total :X Kind of painful but if I wait and it's something I'll use for years and years it will be worth it. Thanks again for your tips.